Lately the weather in Bangalore has become very cold, which I never experienced in my 4 years stay here. Being a winter lover am not complaining at all though. I like to experience each and every season in its full glory…hot and humid summer with Ampora sharbat (Raw Mango drink) to quench the thirst, hot out of the wok Pakodas to enjoy monsoon and colourful winter clothes and warm bowl of soup to beat wintry evenings. For me winter is all about spending the days outside soaking the sun and enjoying the nippy evenings curling under the duvet with a hot cup of coffee and good books. And that’s what I planned to do this weekend. But along with the routine weekly veggie shopping, the baby’s vaccination was also due. We wanted to wrap up all outside works before evening to come back and watch the latest Bollywood fliks. But by the time we managed to reach the market it was already 5. The place was too crowded with a long que at the billing section. The veggies were almost finished and we almost had to fight for those last packets of mushrooms or bunch of celery. But the highlight of the veggie shopping this weekend is we got fresh herbs like Oregano, Basil and Lemongrass, which I never got to cook with. So grabbed the opportunity and settled for a quick warming soup with our favourite cellophane noodles. Tom yum soup is most probably the most famous dish of Thailand. It’s a very light and flavourful soup made with freshest of ingredients. Like all Asian dishes this also is characterized by its very balanced hot and sour taste. The base is made with stock to which fresh Prawns, chickens and mushrooms are added. This has no oil but is flavoured with freshest of herbs like galangal, lemongrass, coriander roots, kaffir lime leaves and chilli pepper. 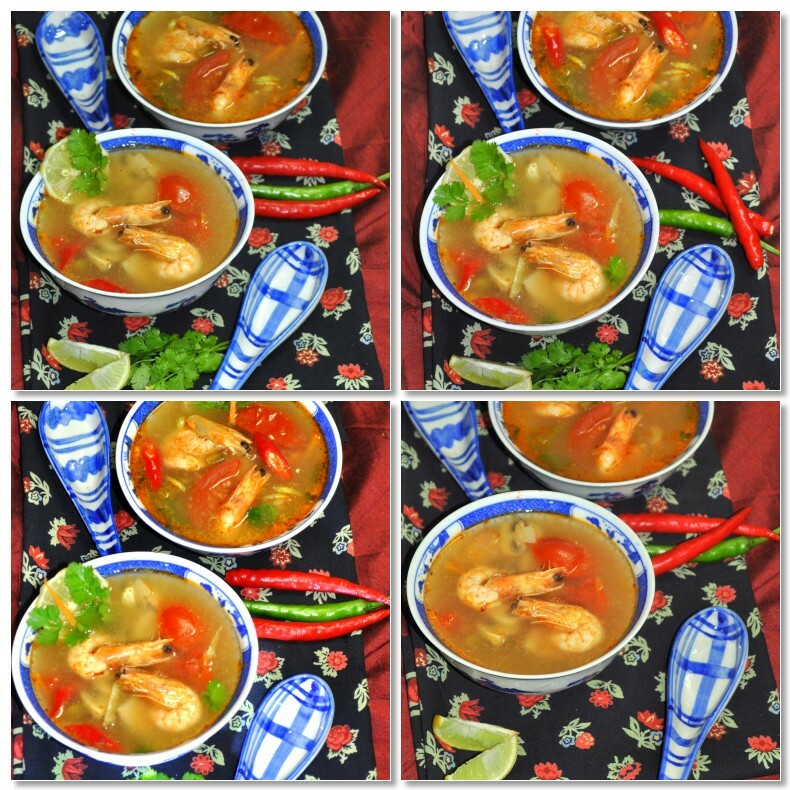 There are various versions of this soup like Tom Yum goong (with prawns), Tom yum kai (with chicken) and tom yum pa (with fish), tom yum po taek (with seafoods) ot tom yum nam khon where coconut milk is also added to the broth. Being said all this now am confused which name to call mine as mine is a hybrid between Tom yum goong and tom yum nam khon. I adapted the recipe from here and then added few spoonfuls of coconut milk…that made this flavour packed soup just perfect with a rounded taste. All in all a very fulfilling, satisfying and warming soup to curl up on the couch to catch your favourite telly show even after a long day at work. For this dish the preparation takes more time than cooking. So lets first prepare the prawn by deveining it. Remove the legs and the shell as well. Wash and keep aside. Rub a pinch of turmeric and salt to the prawn and lightly fry with the oil (probably a minute). Peel and cut the carrot in juliennes, the mushrooms in big chunks lengthwise and the tomatoes in 6 to 8 pieces lengthwise. Remove the outer layer of the lemongrass, slice the stalk and smash in a mortar and pestle. Remove the skin of the small onions and smash in a mortar and pestle. Do the same with coriander roots and ginger. Dry roast the red chillies and with a little lemon juice and salt make a fine paste. In a bog pan or heavy bottomed bowl heat 5 cups of water. Add the stock cubes to this and bring this to a boil. Now one by one add all the herbs like smashed ginger, shallots, green chillies, lemon rind, lemon grass and coriander roots. Cover and simmer for 6-7 minutes till the water becomes fragrant. Now add the prawns (along with the oil), mushrooms, tomatoes and little bit of salt. Cover and again let it cook for 4-5 minutes. By the end of it the prawns would be cooked and would turn pink. Add the carrot juliennes and mix well. Decrease the heat to lowest and add the coconut milk. Mix and finally add the seasoning very little at a time. Lemon juice, chilli paste and salt. The taste should be very balanced with the sweetness of the coconut milk balancing out the sourness of the lime juice and the heat of the chillies. Finally sprinkle chopped coriander leaves and serve Hot with a wedge of lemon. We boiled some cellophane noodles to make our soup more filling. I have made this several times and it tastes equally good without the prawns. To be true I prefer the taste more without the prawns. I have also been showered with these awards. Thanks friends for remembering me. 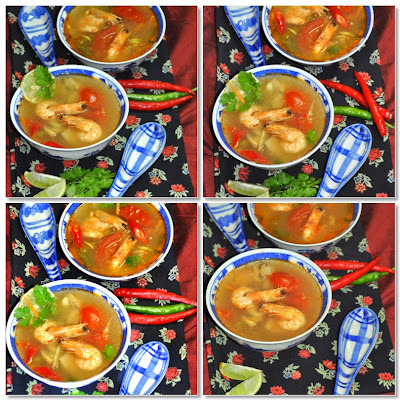 Thai soup, Thai food, Thai curry, Thai prawn soup, Thai hot and sour curry, lemon grass in soup, thai herbs, prawn soup, shrimp soup, sweet n sour clear soup, coriander soup, broth, tomato and vegetable clear soup, best Thai soup, Asian soup, Perfect prawn soup. best ever thai soup, coconut milk soup, fish sauce, soup for dinner, filling soup, cellophane noodle soup, hot and tangy asian soup recipe.galangal, kaffir lime. Wow, that looks superb !!! Omg, feel like grabbing a bowl, soooo tempting and comforting for me.. Delicious and comforting bowl of soup..yummy. This looks awesome, S. I have had it in Thai places, but never made it at home. I must try given the fact that were are lying low in sub zero temps. Delicious hot and sour thai soup. I like it. The Prawn soup looks delicious .... will try it soon. very tempting bowl that is Sayantani.....sedn a bowl to me. @Gagan, then add more veggies like french beans and sprouts. @Pree, try this its very comforting and thanday jhal jhal soup darun lagbe. 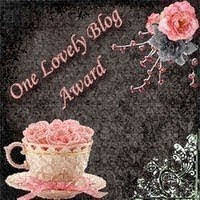 thanx for visiting my blog!...keep visiting! Thanks for visiting me and for your lovely comments. I love Bengali sweets. Hopefully will learn few recipes from you. Isn't weather the most easy topic to start a post :)Thats a perfect perfect soup..spicy & warm.Off late I have started liking Thai cuisine over chinese! Your post came at the right time! That is really yummy! It's one of my favorite soups, done without coconut and added more bird's eye chili for extra kick..
i love crab soups.. i think this must be somewhat like it.. looks yummy.. I like thai cuisine very much and specially the tom yam soups. The soup sounds perfect for this chilly weather here in Canada. Yummy and flavourful soup,thanks for stopping by. And where do you get tom yum ingredients from? 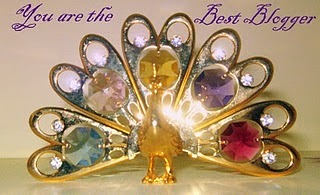 @Seva, thanks for your comment. all the ingredients I have used in this are easily available in India. i reside in Bangalore and shop from the Spar hypermarket; Koramangala branch. if you need I can give you more detailed address of that. thanks for the link. will check that out.